September | 2011 | Crappy Kitchen - Good Dinners! So this blog is about food, but, I have been very interested in what I present my food on lately. Michael was on his way to a wedding with his wife Stacey (another good friend!) and their two delightful children (yes I know, delightful, and children, can be over-used in the same breath, but this time, it is true), and detoured to our house for dinner, and, a night of catching up with old friends. We had lots of fun. We all ate off of different plates and I saved the one above for me. 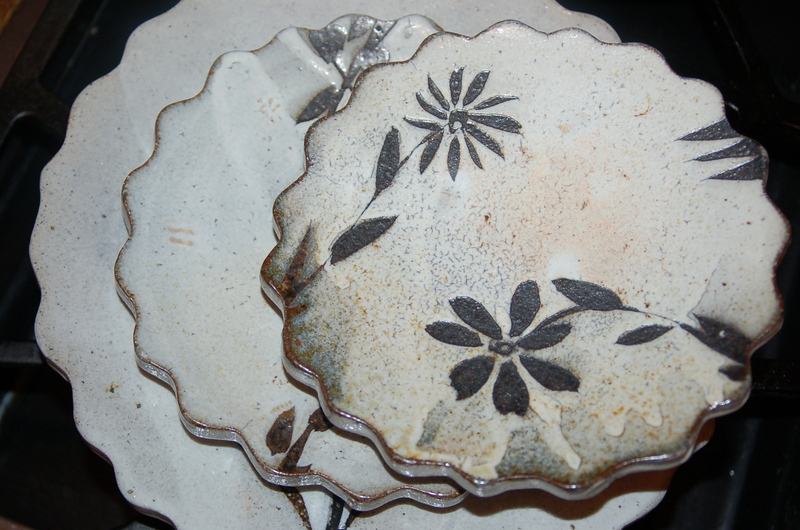 This white and black plate was salt-fired by Michael and has the most beautiful fluted edge. It made me feel all girl-y and pretty. More about dinner and this pot tomorrow! OK – I admit to cheating sometimes. I think cheating is fine when you have a good reason? Last night was one of those nights; I cheated! Before you go getting any ideas, it is clear that I am talking about red sauce, right? Yes, I am guilty of always having a back-up jar of plain old marinara sauce to use in a pinch. Yes, I love making my own, and I do make it 95% of the time, but I hate to be backed into a corner when time is short, and I have a family to feed on the double! 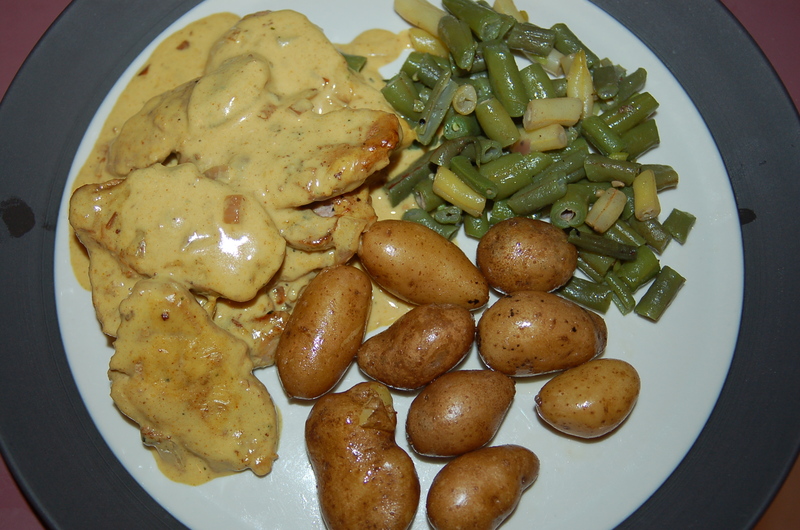 The beauty of this dinner is that it is ready in 20 minutes, start to finish. The thing that saves it from being hum-drum is the addition of fresh herbs, although it would certainly raise no complaints if you didn’t have any on hand. I make dinners like this when getting food on the table is more important than me lolly-gagging at my leisure in the kitchen. 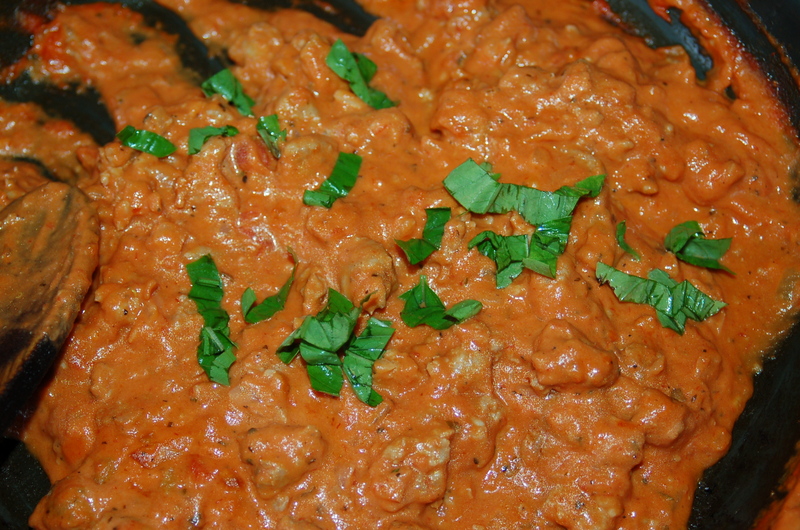 You will need: 4 mild Italian sausages, out of casing and pulled into bite-sized pieces, 4 tbs extra-virgin olive oil, 1 sweet or red onion, small dice, 2 garlic cloves, finely chopped, 1 1/2 cups tomato sauce, 1/2 cup heavy whipping cream, 1 tsp freshly chopped rosemary leaves, 6 fresh basil leaves, salt to taste, freshly cracked pepper, 1 lb spaghetti pasta 9 I used Barilla brand), 1/2 – 1 cup warm pasta cooking water (you will have this when you boil the noodles). 1 – Put big pot of water on for pasta and when it comes to a boil cook noodles according to instructions. Before draining into colander, scoop out 1 cup of pasta water to use later in the finished sauce. 2 – While pasta is cooking, do the following; Put saute pan on medium heat and add oil. 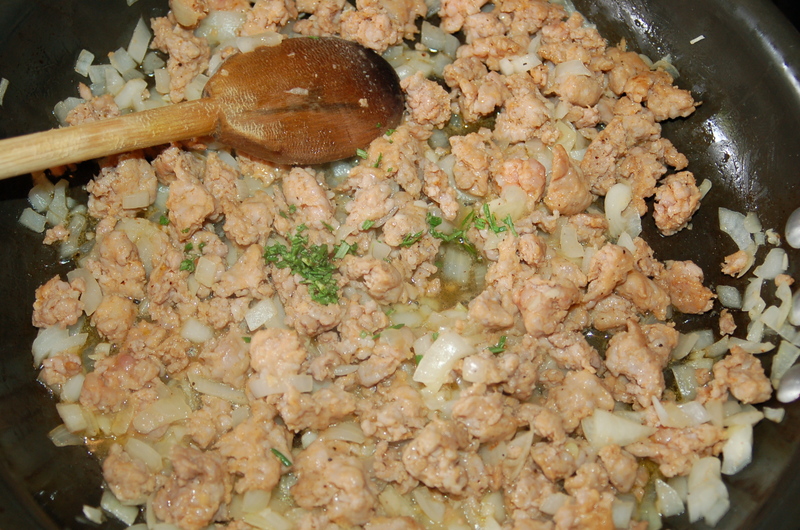 When it has warmed, add the diced onions, garlic and sausage pieces. Cook for 5 minutes, then add the chopped rosemary and several grinds of black pepper. 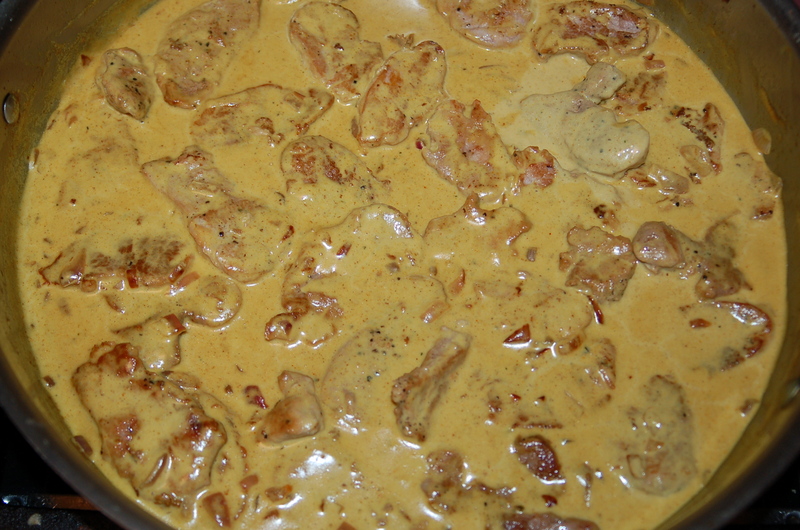 3 – Continue to cook for another 10 minutes, in which time the sausage will start to brown nicely. 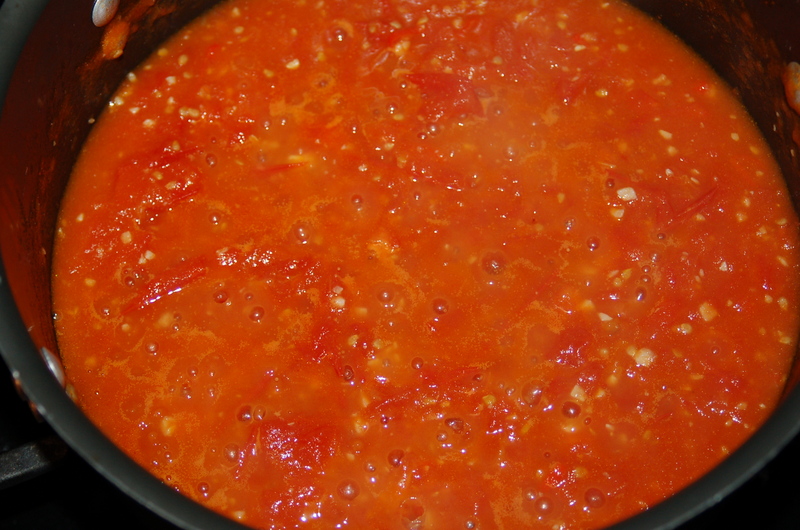 4 – Add the tomato sauce (bought or homemade) and cream, and give everything a stir to incorporate. When it is warm, stir in the basil leaves. 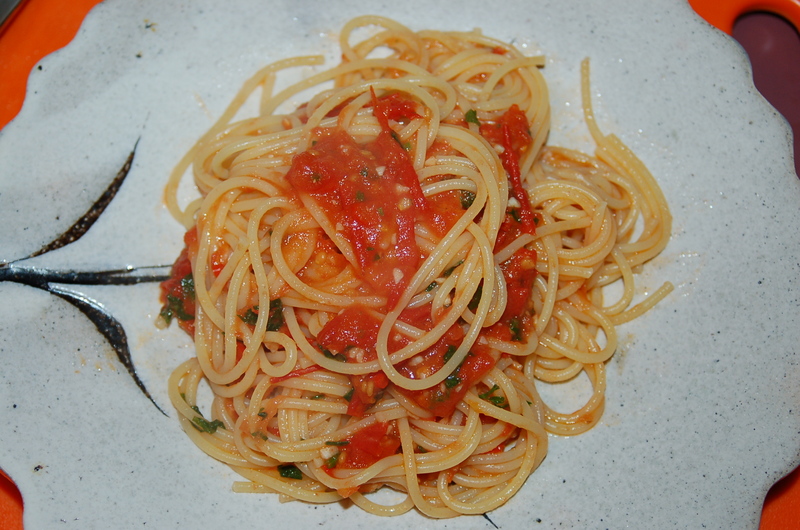 5 – When pasta is cooked, add up to 1 cup of pasta water to sauce to thin it out. Divide drained pasta between warmed bowls and top with generous portion of red sauce. you can also toss the pasta directly into the sauce and let everyone help themselves. When it comes to kitchen stuff, I have to admit that I am spoiled rotten. I have a utensil and dish for just about everything, including several oil containers. Being an artist, my world is naturally filled with creative people who make things. My friend Shawn is one such person. 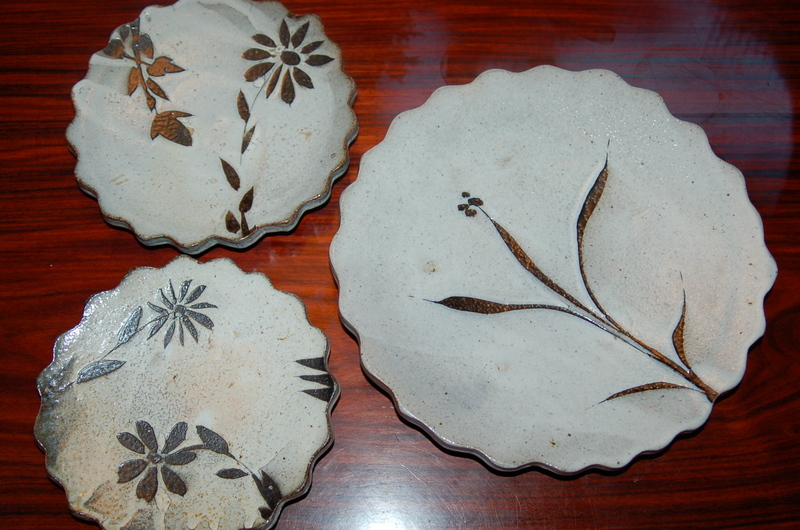 He has been making wood-fired pottery for the past 20 odd years, and his pots only get better. He is present in my house one way or another every day of the week. 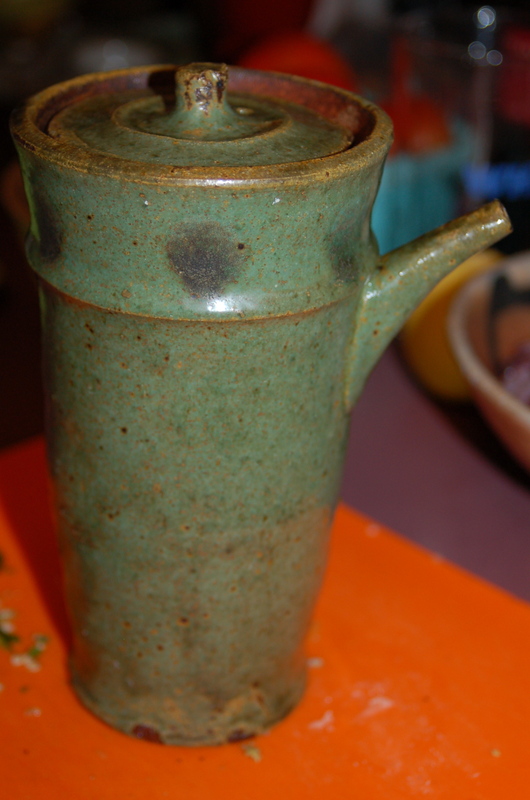 We use his pottery constantly, and they always make our meals happier occasions. To hang out for a firing is fascinated, and a lot of fun. When I happen to around I am usually in charge of the kitchen, while my man Dave feeds the fire with sticks on Shawn’s command. In the 24 hours (or less) it takes to fire the kiln, we work, eat great food, chat, and at the end, drink plenty of wine. This one is especially for my really good olive oil. Top view of the perfect lid. 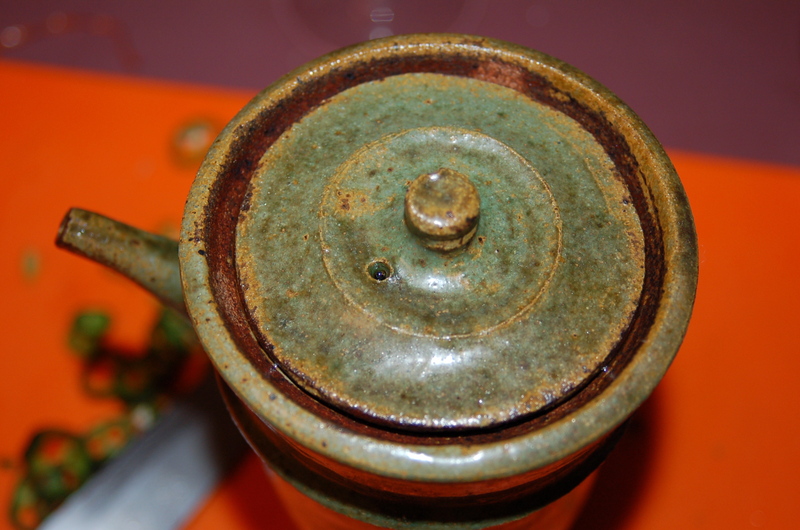 This warm burned-green colored pot sits on my counter-top and is picked up most days, by me, to drizzle oil over something or other. The thought of it being turned on the wheel, shaped, glazed, fired, before eventually sitting on a wooden plank outside of Shawn’s kiln is something that I am aware of every time I pick it up. It reminds me of my friend, and of how he knows that making a container to hold a specific thing, like olive oil is not a waste of time. He knows that the tools we use on a daily basic should be beautiful, and in turn enrich the user’s life in some way or other. These are the corny, but important things I have to say about people who make lovely things. Settling for some piece of crap (there, I said it) from a shop whose sole purpose is to take your money without a though for how it was made, and under what conditions, is possibly something that is worth thinking about. There is the question of what you can afford, but, maybe think about it a different way. Think about how many times you have to replace said piece of junk for yet another piece of junk, and if you should really be putting money in the pocket of someone who doesn’t give a hoot about you, or the person who they paid next to nothing to make it. I am as guilty as the next man of buying shoddy goods because they are cheap, but am trying very hard to go without until I can afford something that is beautifully made, with the best of intentions. Sometimes I am not in the mood for a big dinner, but still crave the savory taste of something lighter. This was the case when we had a very late lunch, and so I decided to make this sumptuous soup. It still had a vegetable, and protein, and, with the help of crusty bread, the carbohydrate was taken care of as well! 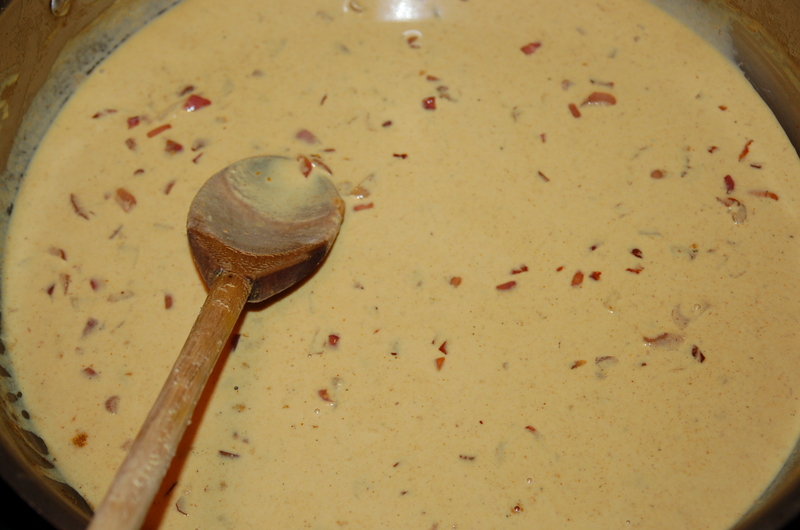 Cooking, and then pulverizing the bacon into the soup puree gave the little bacon I used, a presence in every spoonful. I bought something called a Double Cream Cheddar out of curiosity the other day and it turned out to be the perfect balance of creamy texture and sharpness. This was a great light dinner, but of course would also make a lovely lunch or first course to a meal. You will need: 4 big broccoli, including all of the stem save the last 2 inches, separate the florets & slice the stem, 1 small red onion, diced, 6 pieces of bacon, 1 1/2 cups cheddar cheese, 3 cups chicken broth, 1 cup heavy cream, salt and pepper to taste. 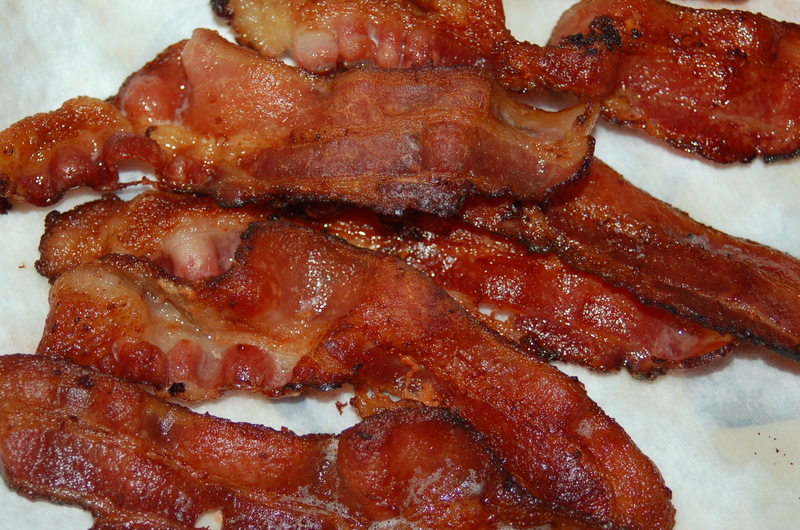 1 – Cut three pieces of bacon into slices. Put medium soup pot on medium/low heat and add the bacon. Cook until getting slightly crispy (8 or so minutes). 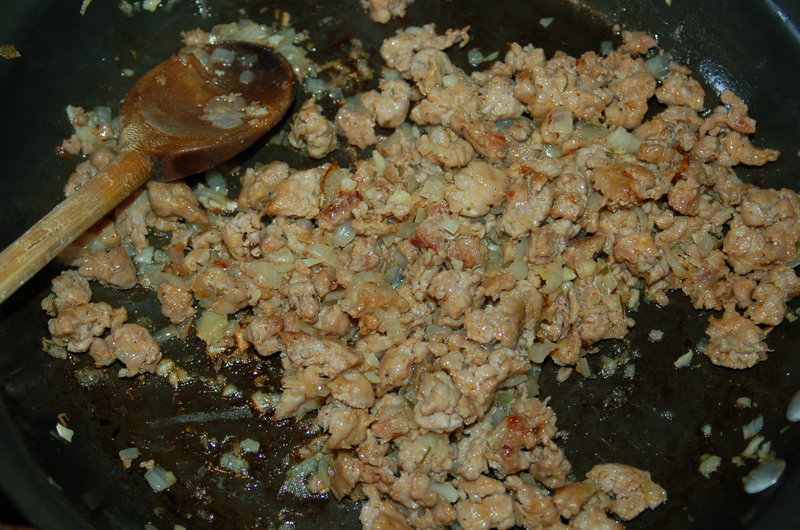 Add the diced onion and continue to cook for another 8 minutes, stirring occasionally. 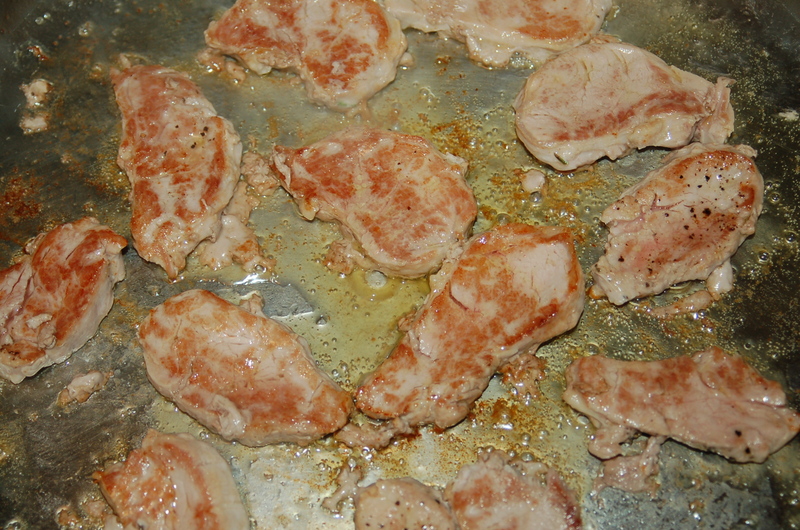 2 – While onions are cooking, fry the remaining stripes of bacon. When cool enough to handle, chop and set aside until serving soup. 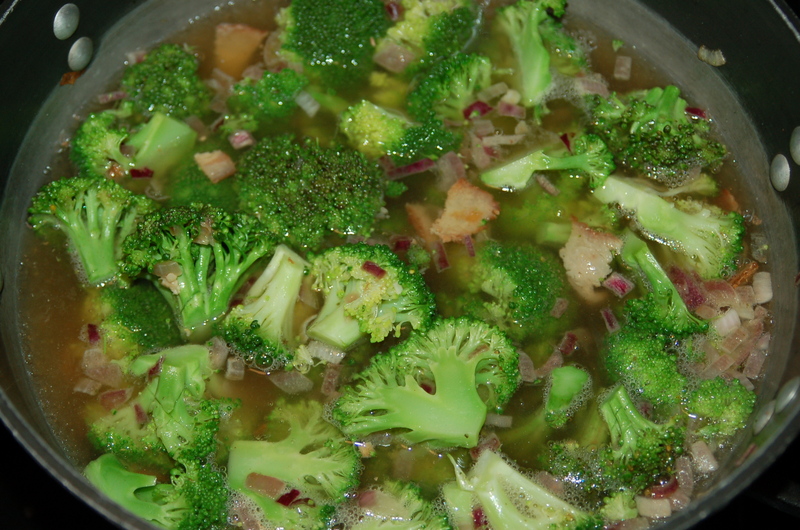 3 – Add the broth and broccoli and bring to a simmer. 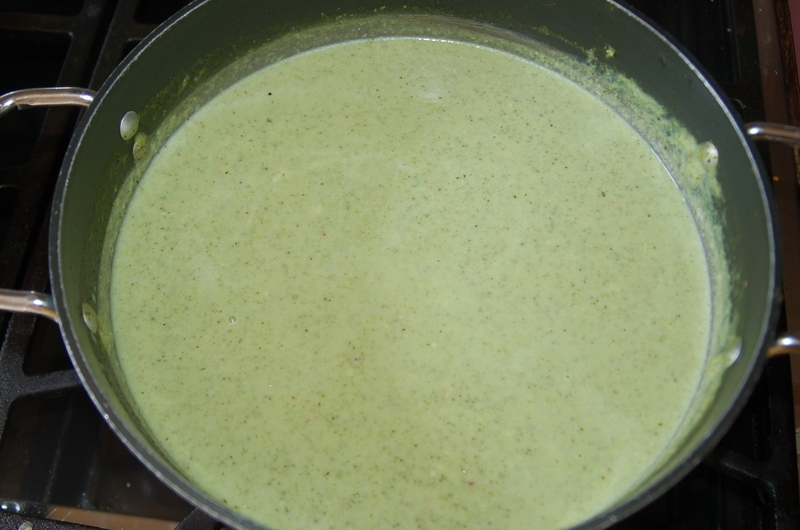 Cover and simmer gently until broccoli is soft (10 minutes). 4 – Turn off heat and let liquid cool for 10 minutes. Scoop solids from liquid and transfer to food processor along with the heavy cream. Blend until very smooth. Pour broccoli back into pot making sure to scrap the sides of the processor. 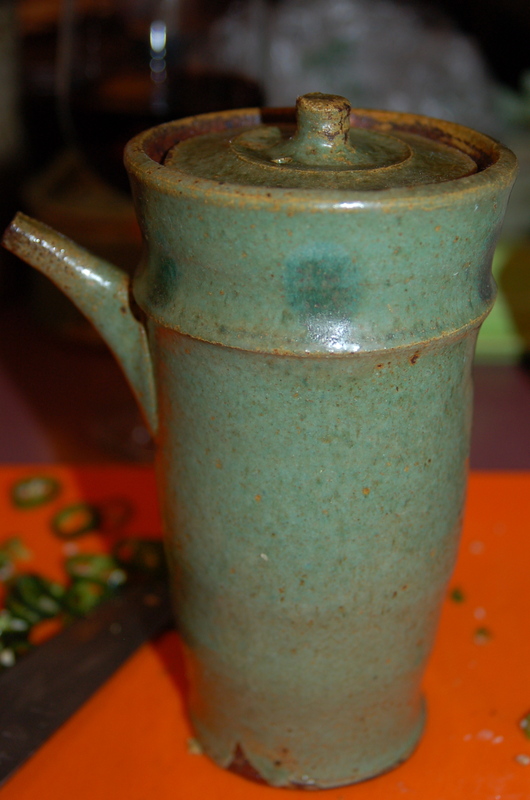 5 – Taste for addition of salt and pepper. Turn on stove to medium heat and add the cheese. Stir until cheese has melted and the soup is hot. Add more cream or broth if you like a thinner soup. Turn off heat. 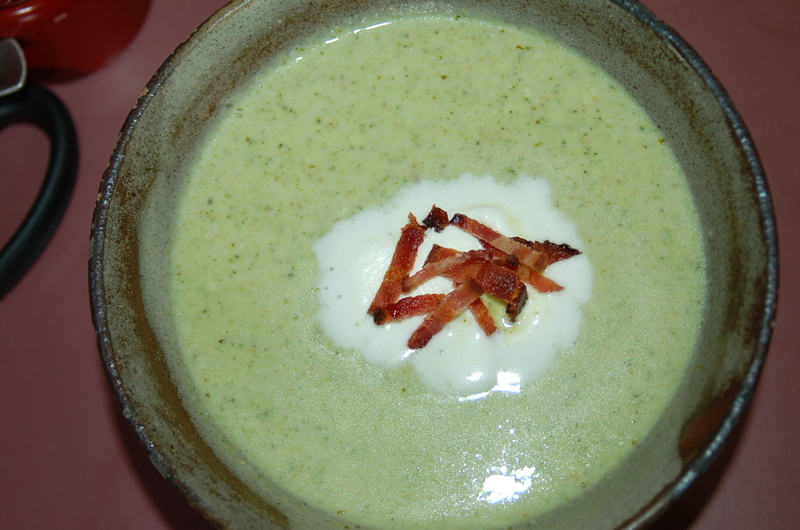 Ladle into bowls and top with a dollop of whipped cream and chopped bacon. 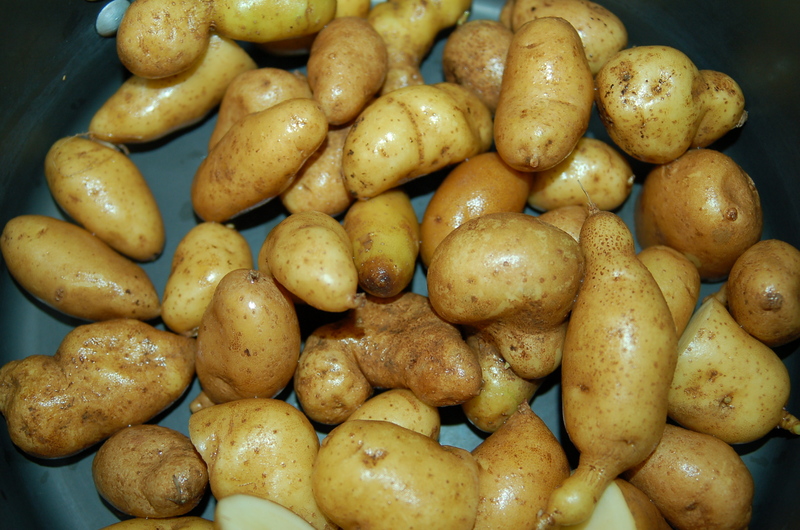 Serve with fresh crusty bread. Yes, I know, more talk about peppers. This time however, it was purely accidental , in that I was not desperately trying to find new ways to use up my cut-and-come-again crop in the backyard! Lucky I had these to satisfy my longing to try out a new recipe! What happened was, this weekend, myself and my man Dave were in New York City, and met up with 2 very special friends whom we had not seen in many, many years. My one friend Ellen, is a chef, and lived and worked as a chef in the city for years before high-tailing it to a sunnier location for an easier life. So, going out to dinner can be a bit of a challenge, as her standards are high when it comes to food (lucky us!). We were in luck the other night and found an amazing Mexican restaurant. When we got there the place was completely packed and buzzing with excitement. We got a table after only a short wait and from that moment on, all I remember is food, friends and bliss. Ellen ordered all sorts of tidbits for us to taste, and we got to sample at least 6 different dishes. Myself and Ellen fell in love with the roasted pepper dish. 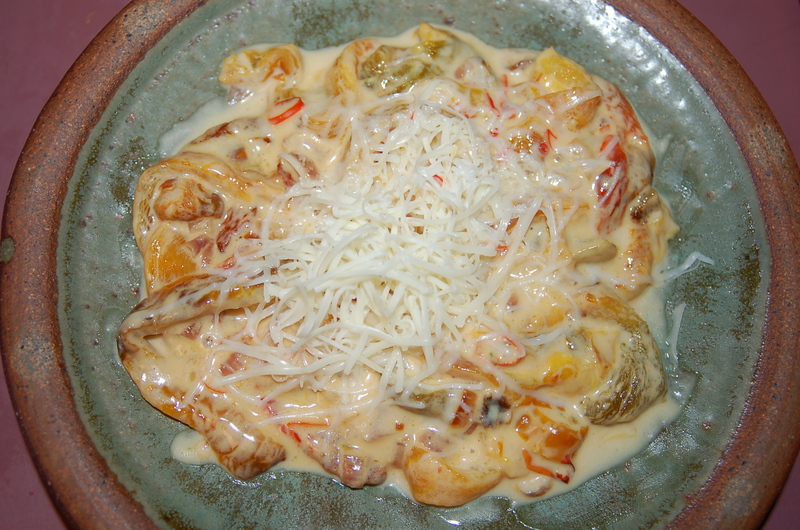 She told me it was roasted poblano peppers cooked in cream and topped with a mild white cheese – wow, I was impressed that 3 ingredients could pack such a punch? 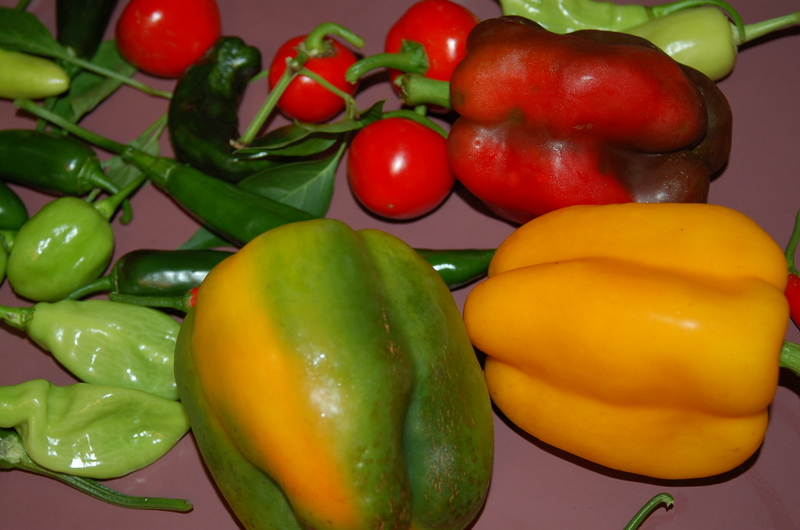 When I left the glamour of the city for the Crappy Kitchen, I wished for those creamy peppers. 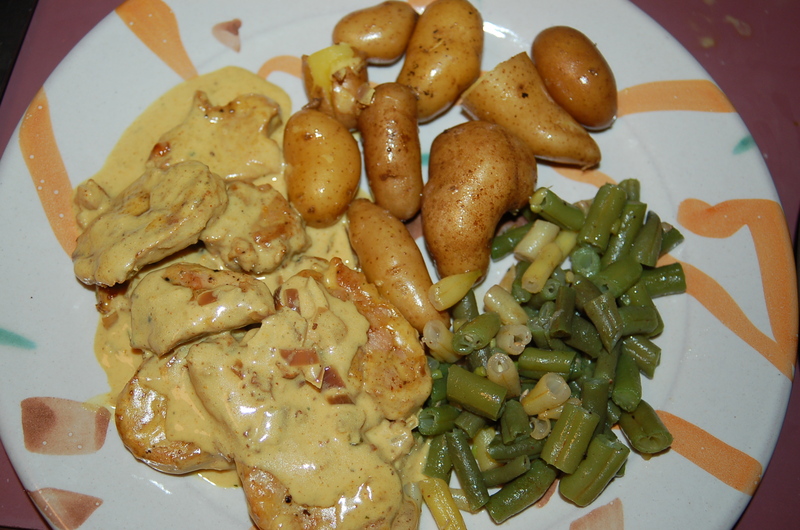 Peppers simmered in cream…….how hard could that be to replicate? I had tons of peppers (no poblano, but I did have cayenne peppers which would satisfy the heat element, along with a colorful assortment of regular sweet peppers), and so gave the dish a try. I am so brilliant, because it turned out amazing. I now have a new dish under my belt, which means, so do you! We had it with some sort of sweetened chip, but I think corn chips are just as good. I am also going to try it on a nice piece of toast for breakfast! You will need: 4 sweet peppers (mixture of red, yellow, green & orange), 3 fresh cayenne peppers, (OR, 2 sweet peppers & 3 poblano), 1 small red onion, small dice, 1/4 cup & 2 tbs extra-virgin olive oil, 1 cup heavy cream, 1/2 tsp sea-salt, 3/4 cup mild cheese (I used a double cream mild white cheddar), corn chips. 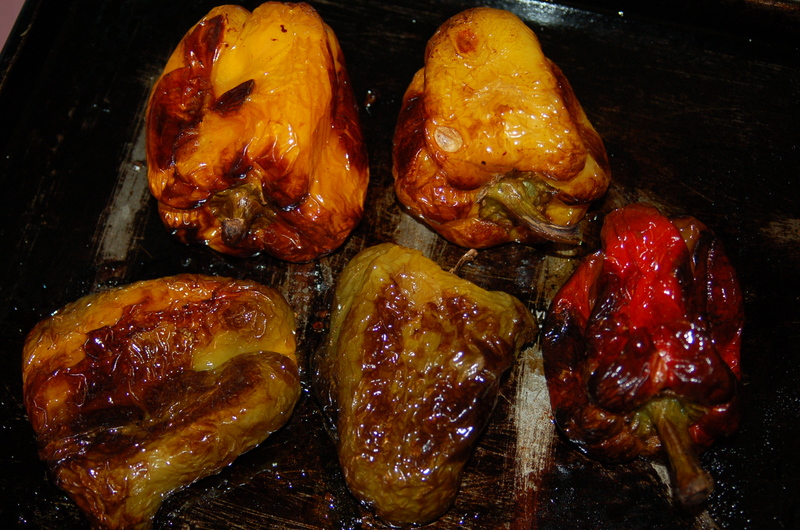 1 – Put peppers on baking tray and rub with 2 tbs of the olive oil. Place in preheated oven and cook for about 40 minutes, turning every 15. Remove and place in heavy brown paper or plastic bag and seal for 15 to 20 minutes. When cool enough to handle, take out, remove the seeds, and peel the skin. 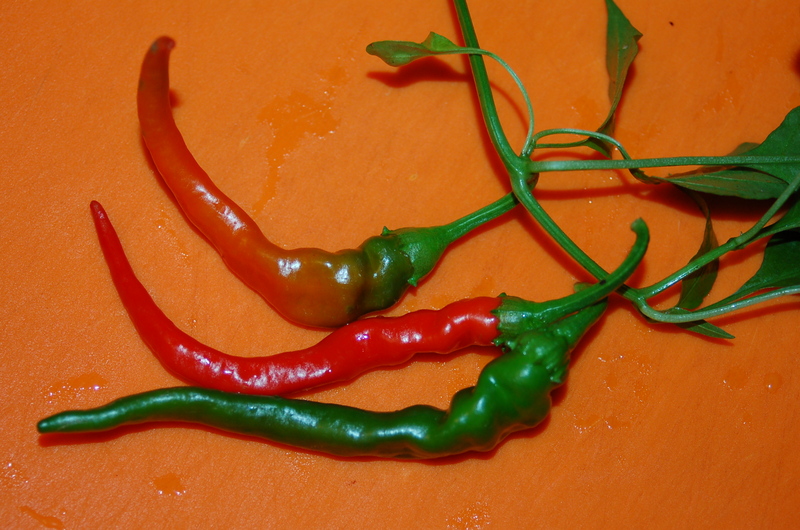 Slice thinly into long strips and slice the cayenne peppers. 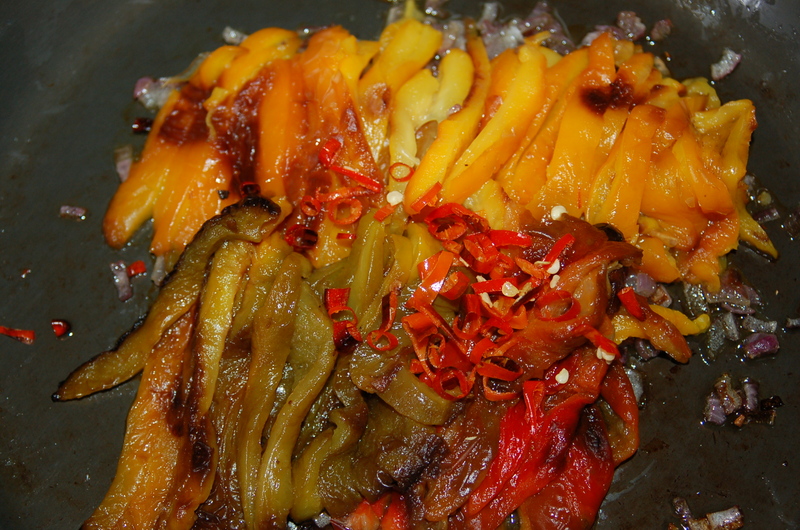 2 – While peppers are roasting saute the onions for 10 minutes on medium heat in the remainder of the oil (1/4 cup). 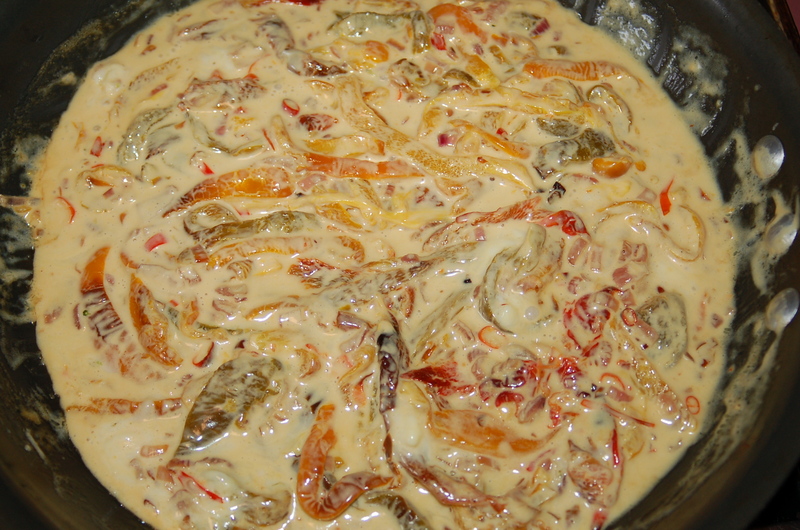 Add the sliced peppers to the pan, then the cream and salt. 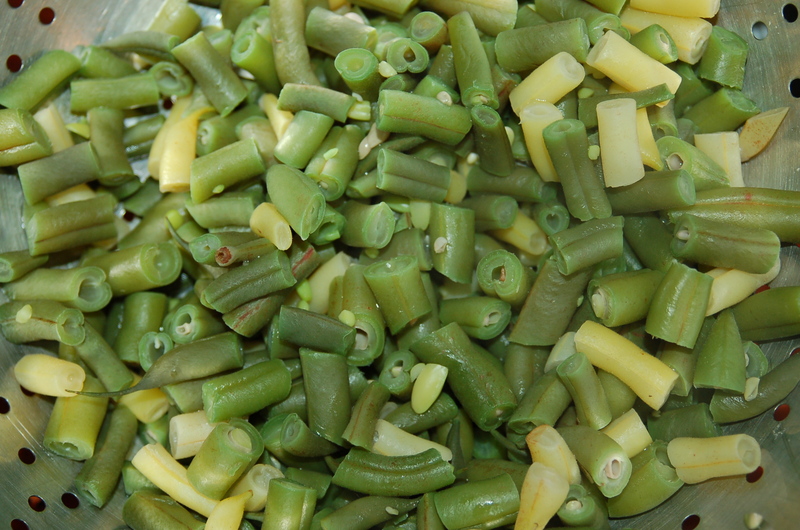 3 – Bring to a boil and simmer for about 3 minutes. Turn off heat and add the cheese. Give everything a stir until the cheese has melted into the cream. Serve topped with more cheese and tortilla chips (or toast). I am also thinking it would be good with eggs and a flour tortilla. 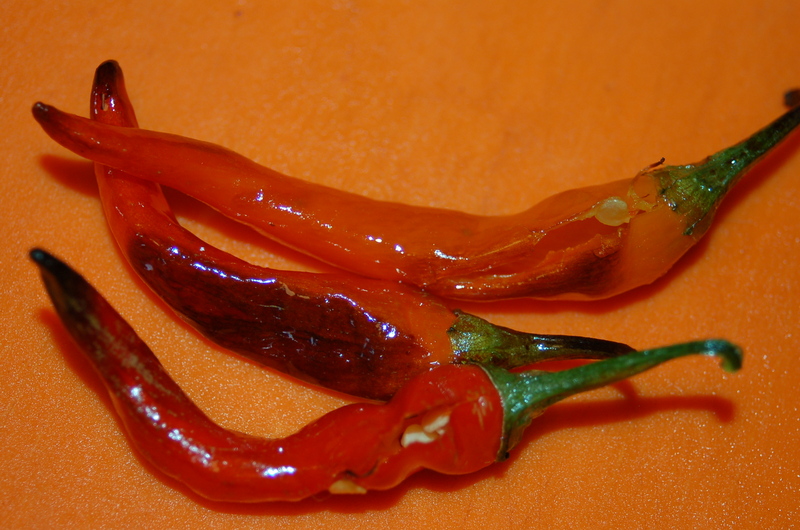 What else could I do with my crop of cayenne peppers besides drying them? I decided to see how they would fair in a spicy puttanesca sauce. There were four main ingredients in this sauce and I am proud to announce that they came from either my garden (parsley & peppers), Rambler Farm (garlic) or Good Work Farm (tomatoes). How could I possibly go wrong. I had never made a puttanesca sauce without using San Marzano canned tomatoes, and cayenne pepper flakes, so this was going to be very interesting. I was not particularly sure my kids would go for such a minimal dish either, but I was determined not to think about it, and let my curiosity take over. I was so impressed with the final result! It was not as hot, but the heat felt fresher, if you can imagine that? The tomatoes were sharp and everything was balanced magically by the earthy-tasting parsley. 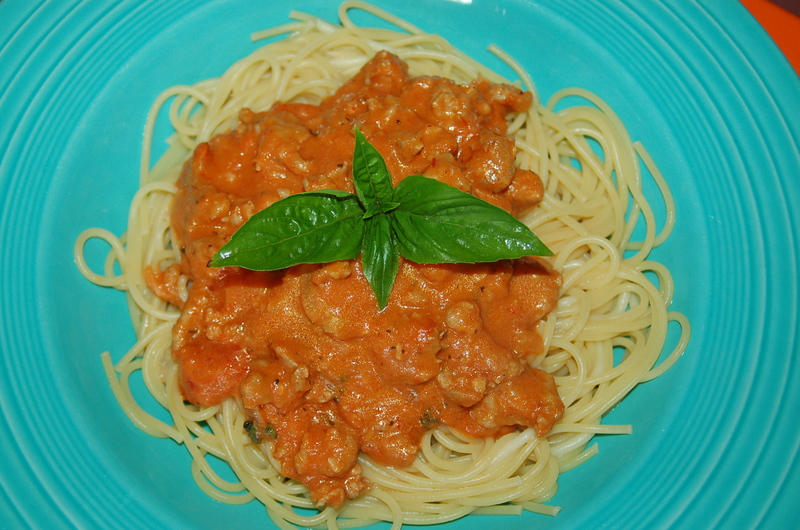 My kids couldn’t get enough of this fresh take on a spicy tomato sauce. I will long for this dinner when it is wintertime and there isn’t a tomato or pepper in sight. This meal was all about right-from-the-ground-taste and would be hard to replicate out of season. What am I saying? Very simple; make this before the bounty disappears! 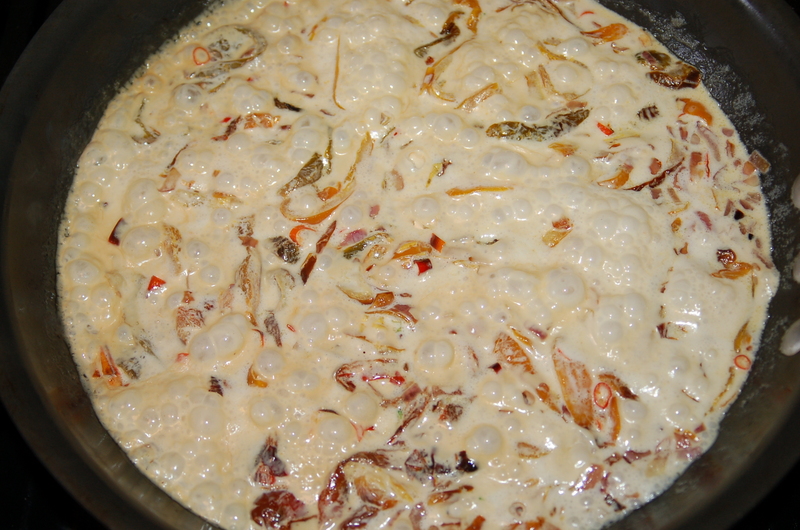 1 – Put saucepan or pot on low heat and add oil. 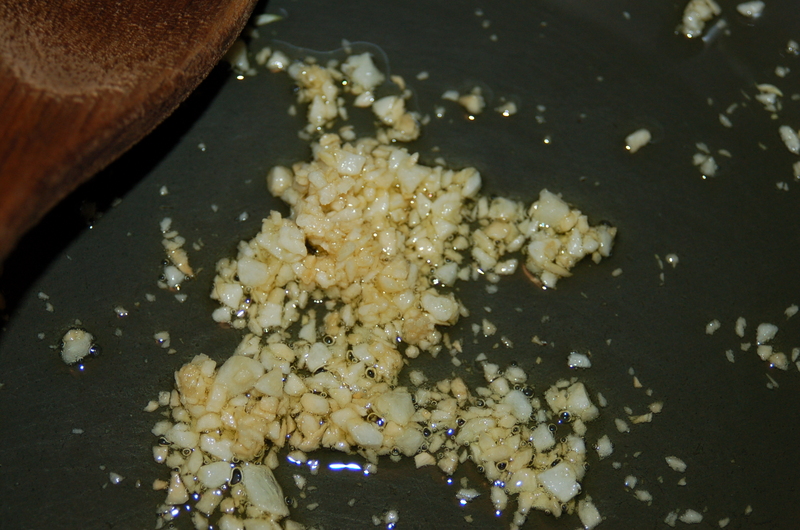 Add chopped garlic and cook for about 8 minutes, stirring occasionally. 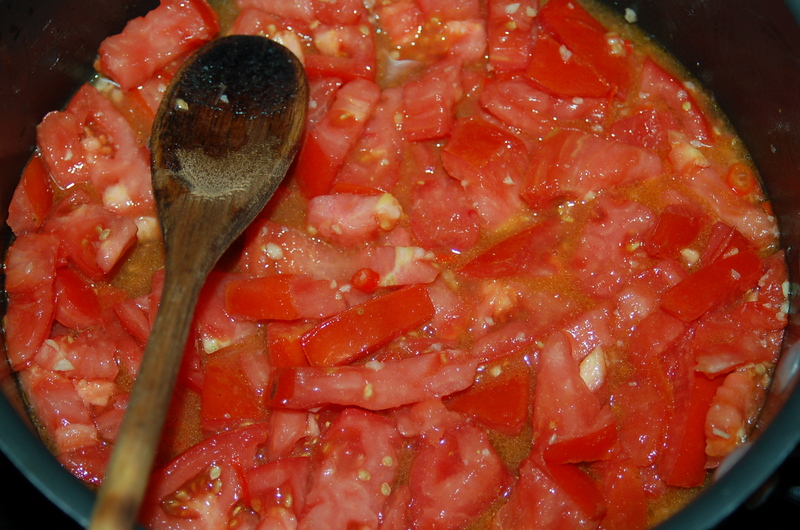 2 – Add the diced tomatoes, salt, and cayenne pepper slices. Bring to a steady simmer and cook like this for about 15 to 20 minutes. 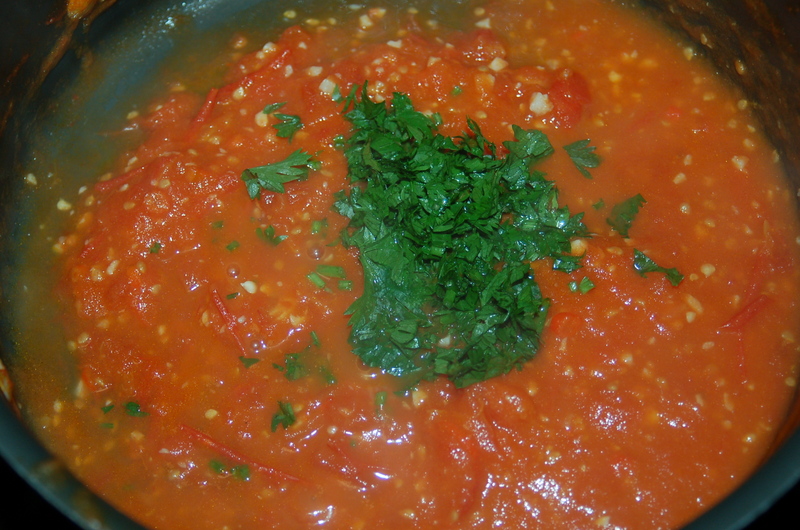 3 – While tomatoes are cooking put on pot of water for pasta. When it comes to a boil, cook pasta according to instructions. Try to have it ready when sauce is cooked. *Reserve about a 1/2 cup of pasta water in case you need it for the sauce. 4 – Add the chopped parsley and give everything a stir. The moment the pasta is cooked, drain and add immediately to the sauce. add some pasta water if you want a looser sauce. Taste for seasoning and adjust if necessary. Turn off heat. 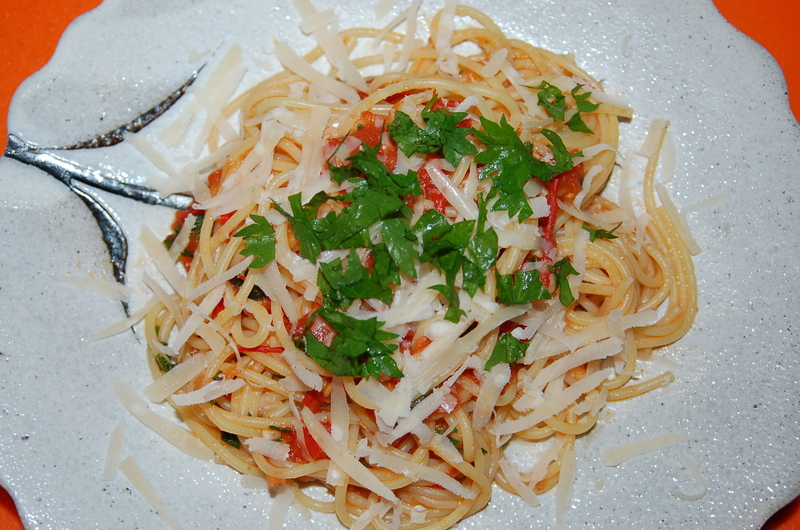 Serve on warmed plates with more parsley and Parmigiano Reggiano. Super good food!